· Android is an open source mobile OS led by Google. 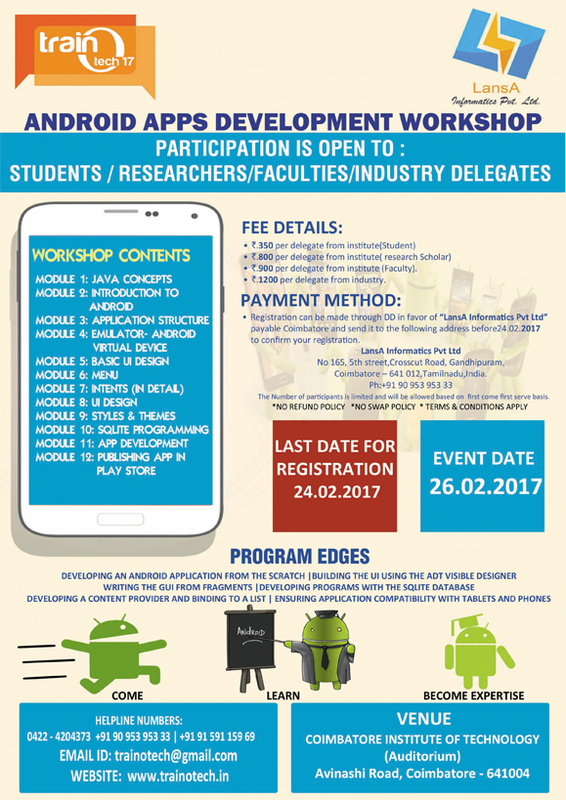 This workshop introduces about Android, the fastest growing mobile OS. The job opportunities in this stream are not only restricted to the manufacturing, repairing and maintenance of mobile handsets but also it provides a lot of career opportunities in mobile application development for software professionals. · The objective of the workshop is to enable the participants to develop mobile applications on their own and to train them to use Eclipse as IDE. · To promote students technical career towards the new technological developments that happens in the industry. · To bring students of various streams in to one roof and chance those to broaden technical knowledge of the students with the latest trends and technologies followed in the industry. · Participating in this workshop gives an opportunity for the Students/Academicians Industry to interact participants with the technocrats.